On Susie G's spectacular debut EP, You and I, Susie and her band explore a layered, expansive, impressive sonic landscape, built upon tight and textured voice and instrumentation. But as big as the sound is on the new EP, the songs stay grounded in a sense of intimacy and bittersweet emotions that underlie the signature sound and songwriting of Susie G.
There's a cohesive tone to the tracks on You and I, and the soundscape perfectly augments the nuanced expressions of passion and sadness in each song. The EP is built upon warm synths, thick guitars, and dark tones that echo the emotional intensity and swaying dance-ability of each melodic turn. Jerett Samples sculpts guitar lines that sing powerful countermelodies to Susie Garcia's vocals. Gregory Olson's bass also deserves special mention, particularly on the track "Frequency". And TJ Orgovan's drums buoy the driving rhythms throughout the EP. This is a band that knows who they are and knows exactly what they want to say. Although this is a debut EP, there are several strata of complex meaning in each song. It's not often that music is able to reframe themes of love and intimacy in a new light, but that's exactly what Susie G does in You and I. But even though the emotional notes and accompanying sonic swells are ethereal and dense, the songs still pulse in catchy, dance-able rhythms. The title track, "You and I" is a stand-out, and speaks of intimate secrets with a beat that is just as resonant as the message. The entire EP deftly contours sonic warmth while maintaining moving rhythms. In summary, this is a fantastic EP from a band with moving songwriting and highly skilled musicianship. You and I will make you want to dance in mind, body, and soul. 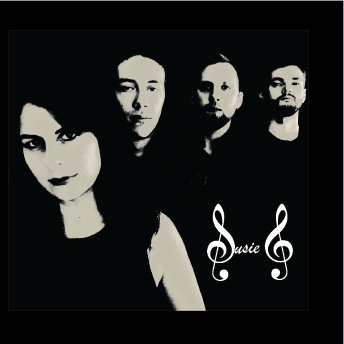 Catch the EP release show for Susie G's You and I on March 22nd at the High Dive.